Broken-overcast this early Wednesday on California’s north coast, with sunshine playing a more aggressive part in our morning — hope is for more brightness this afternoon. Yesterday was about the same, too, but little sunshine arrived later. According to the NWS, there were more than 500 cloud-to-ground lightning strikes on Monday across the interior of the northern part of the state, a few less yesterday and some forecast for today — not much rain with all that light, however. 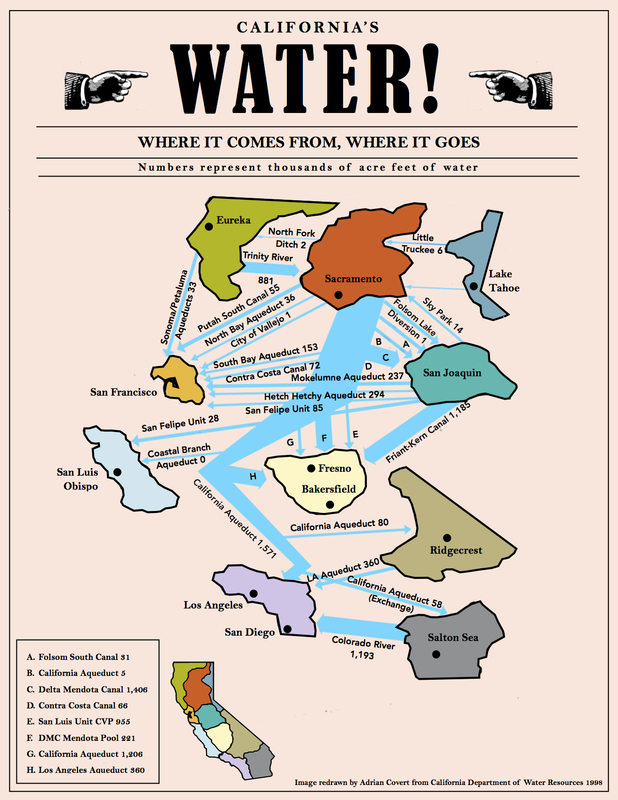 The fine was plastered against a water district down in California’s Central Valley, the fertile water-famished supposedly breadbasket of the world. And turnabout is fair play, I guess, and the district is joining another to counter-sue the state. The campaign highlights one of the main issues surrounding California’s record-breaking drought — one which hasn’t been getting much press: The water-intensive cattle industry. At any one time, there are more than 5 million cattle in California, and they use nearly half of the state’s water supply. To put that figure into more personal numbers: It takes 2,500 gallons of water to produce just a single pound of beef. A pound of wheat, by comparison, requires only 100 gallons to produce. (via AlterNet). Nearly one-fifth of the raw groundwater used for public drinking water systems in California contains excessive levels of potentially toxic contaminants, according to a decade-long U.S. Geological Survey study that provides one of the first comprehensive looks at the health of California’s public water supply and groundwater. One of the surprises in the study of 11,000 public supply wells statewide is the extent to which high levels of arsenic, uranium and other naturally occurring but worrisome trace elements is present, authors of the study said. (via NBC Bay Area). And now, from down in the above-mentioned Central Valley, a revival of an old water-search technique. Tassey is what is known as a “water witch,” or a dowser — someone who uses little more than intuition and a rod or a stick to locate underground sources of water. It’s an ancient art that dates back at least to the 1500s — though some dowsers have argued the origins are even earlier, pointing to what they say is Biblical evidence of Moses using a rod to summon water. In California, farmers have been “witching the land” for decades — though the practitioners of this obscure ritual have never been as high profile or as in demand as during the last year. With nearly 50 percent of the state in “exceptional drought” — the highest intensity on the scale — and no immediate relief in sight, Californians are increasingly turning to spiritual methods and even magic in their desperation to bring an end to the dry spell. At greatest risk is the state’s central farming valley, a region that provides fully half the nation’s fruit and vegetables. Already, hundreds of thousands of acres have been fallowed, and farmers say if they can’t find water to sustain their remaining crops, the drought could destroy their livelihoods, cause mass unemployment and damage the land in ways that could take decades to recover. The severity of the latest drought has raised the ante even higher. With landowners across the valley desperate to tap into water, it costs thousands of dollars just to get on a waitlist for drilling that is often several months long. Desperate farmers have little margin for error. If they drill a hole and find nothing, it’s money that’s gone, and they are back on the waitlist again. They are betting on witches to help them find the magic mark. Scientists roll their eyes at the phenomenon. Graham Fogg, a hydrologist at the University of California, Davis, called it “folklore” and said there is no scientific proof that dowsers have any special skill at finding water. Anybody with a basic knowledge of an aquifer is likely to be able to tap into something. As this drought continues, and the dry of the land persists, whatever it takes will prevail — witching it so, however, may/may not make it so.